A research and development facility for algae biofuels soon will be built on The University of Toledo Scott Park Campus of Energy and Innovation. 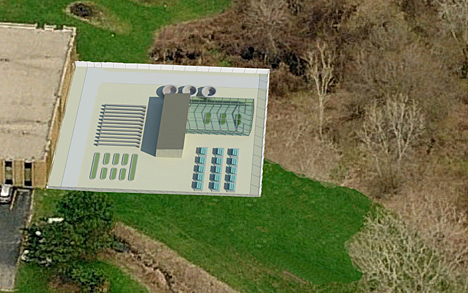 This rendering by SSOE Group shows the Center for Algal Engineering Research and Commercialization that will be built on the Scott Park Campus of Energy and Innovation and include open ponds, ponds in a greenhouse and enclosed photobioreactors to test the efficiency of different growth systems. It also will have pilot-scale capabilities of converting the algae materials grown there into fuel. The pilot-scale facility is part of a research project recently awarded a nearly $3 million grant through the Ohio Third Frontier Wright Projects Program that links research capabilities of Ohio colleges, universities and nonprofit research institutions with the needs of industry in the state. Ohio University and UT are leading the three-year Center for Algal Engineering Research and Commercialization project that has a dozen collaborators, including many Ohio businesses involved in the energy industry. For UT’s part, the half-acre facility at Scott Park will be constructed to include open ponds, ponds in a greenhouse and enclosed photobioreactors to test efficiency of a variety of growth systems. The facility also will have pilot-scale “downstream processing” capabilities where the algae materials could be converted to fuel — a complete system, said Dr. Sridhar Viamajala, UT assistant professor of chemical and environmental engineering and a principal investigator of the project. The oil from algae can be used to make fuel, just as soybean and vegetable oil can, but the difference is that algae are not a food source. Algae don’t need clean water or high-quality land to grow, and because they are simple, single-celled organisms, they grow much faster than more complicated plants, Viamajala said. But creating fuel from algae is not yet done commercially. This research project will help advance the best practices of doing so and put Ohio on the map in this field. Dr. David Bayless, Ohio University’s Loehr Professor of Mechanical Engineering, said UT’s role is instrumental in the research project because it will create a place for researchers and industry to test different aspects of algae. OU already has such a facility and will increase its analysis through this project, Bayless said. UT College of Engineering Dean Dr. Nagi Naganathan said the ability to facilitate vibrant university-industry partnerships will accelerate the development and growth in the field of algal biofuels. Naganathan also recognized the support from several individuals that made this possible: Chuck Lehnert, vice president for facilities and construction; Dr. Frank Calzonetti, vice president for research and development; and Tony Damon, CEO of SSOE Inc., and his staff. “This has been truly a team effort,” Naganathan said. The additional partners on the state algal biofuels project are: Algae Producers of America, Center for Innovative Food Technologies, Recombinant Innovation, Harrison County Engineer, Red Lion Bio-Energy, Midwest Biorenewables, Lubrizol, Independence Bio-Products, Tri-County Career Center, Parker Hannifin and Univenture. The Ohio Third Frontier Wright Projects Program awarded a total of more than $20 million in funding to advance the state’s key technology sectors by supporting improvements to colleges, universities and research institutions, which in turn support the commercialization objectives of Ohio companies. This entry was posted on Tuesday, June 29th, 2010 at 5:21 am and is filed under Research, UToday .